CHICAGO -- The much-anticipated arrival of Teuvo Teravainen dominated a busy morning skate for the Chicago Blackhawks on Friday at United Center. The 19-year old Finnish forward, Chicago's top prospect, officially joined his new team on the ice for drills but won't play Friday night against the Carolina Hurricanes. Instead, the Blackhawks want to give Teravainen some time to get acclimated to his surroundings. They also want to take as much pressure off his shoulders as possible, even as fans look to him to ease the sting of losing right wing Patrick Kane to a lower-body injury for the rest of the regular season. "The thing we just want to be cautious about is he's a 19-year-old kid," Blackhawks general manager Stan Bowman said. "He's not coming in here to carry the team. 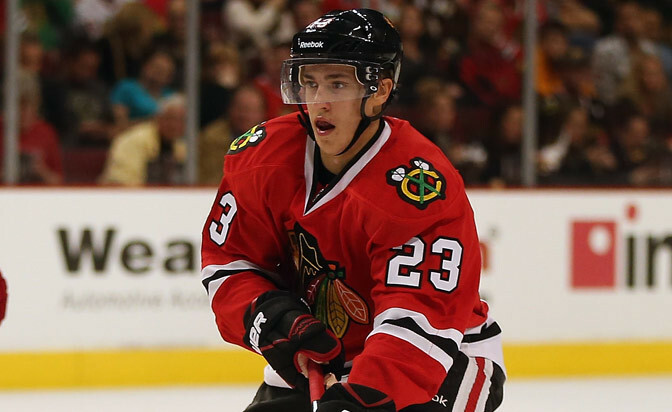 We certainly have high hopes for him in the future, but this is more just an experience for Teuvo to come in and see what the NHL is all about." It's also a chance for the Blackhawks to further assess Teravainen, who had a nice season for Jokerit in the Finnish Liiga and led Finland to the gold medal in the 2014 IIHF World Junior Championship. After playing left wing for Jokerit a year ago, Teravainen started this season playing center in Blackhawks training camp. He continued the center experiment with Jokerit and finished with 44 points in 49 games (nine goals, 35 assists). That ranked seventh in the Liiga in points and second in assists. Chicago has been searching for a center to play on the second line with Kane and the hope is Teravainen will eventually be the answer. If he plays 10 games during the regular season or Stanley Cup Playoffs, the first year of Teravainen's three-year entry-level contract will be burned, but Bowman said that isn't a factor in how much he'll play. His performance down the stretch will ultimately dictate his ice time, and reports about his improved play in Finland claim Teravainen can handle a center's responsibilities. He has improved his strength on the puck, focused on playing better defensively, and added strength to his 5-foot-11, 169-pound frame, something the Blackhawks hoped he would do when they selected him with the 18th pick in the 2012 NHL Draft. Now it's nearly time to see if all that hard work will pay off. Blackhawks coach Joel Quenneville said he'll probably start Teravainen at center, but the prospect is happy to contribute any way he can. "I can bring something," Teravainen said. "I try to play with my strengths and maybe some offense. I hope I can help. Of course, there are big expectations and pressure, but I don't think of those too much. I think everything I do here is a bonus. I'm just trying to have fun." It's just that he'll be doing it for the defending Stanley Cup champions, who did everything they could to downplay their expectations of him this season. They're not denying Teravainen's high potential and skill, but the Blackhawks are being careful not to heap too much pressure on him too soon. "We've been really pleased with his progress since we drafted him," Bowman said. "Looking at his season this year, he showed that he could be a dominant player in the top league in Finland and he's going to come in here and just be a piece of the puzzle. He's just going to fit in like the other guys on the team … we're trying to be aware that there's a lot of excitement around him, and understandably so, but he's just another player on our team and it's a team sport. So we're trying to be cautious with that." They're being cautious with Kane as well. Rather than rushing him back to get in a game before the start of the playoffs, Bowman pronounced Kane out for the remaining 12 games of the regular season. He said Kane should be ready to go for the start of the playoffs. "If there's a guy who can turn it on and off, it's definitely [Kane]," forward Kris Versteeg said. "Out of nowhere, you can see it throughout a game. You might not notice him for one or two shifts and all of a sudden he's got the puck for an entire shift. He really knows how to turn it on and rise to the occasion when he needs to, so I think these three weeks will help him get stronger and rested." There is speculation in Chicago that Kane has an MCL sprain in his left knee, which wouldn't require surgery and typically takes 3-4 weeks to heal. That's around the same timeframe the Blackhawks have given for Kane's recovery. Bowman did his best to quell any concerns explaining what he meant when he initially described Kane's injury as "nothing too serious." "I think what I meant with 'nothing too serious' … usually when a guy has an injury that requires surgical intervention, that's something that is going to set him back a little bit longer," Bowman said. "This is not that kind of an injury, so we're not going to get caught up in what the diagnosis is. But he'll be out the same timeframe as [originally stated]. Nothing's changed and we're going to focus on getting him ready for the playoffs." The Blackhawks are one point ahead of the third-place Colorado Avalanche in the Central Division going into action Friday and hope to secure home ice for at least the quarterfinal round of the Stanley Cup Playoffs. They'll need to compensate for Kane's absence, but that task won't fall on one or two players. "I think when we play as a team, like we did Wednesday night [against the St. Louis Blues], I think you saw we really played our best hockey," Bowman said. "We had all of our lines going. That's sort of the hallmark of our team, when we can get everybody involved, all the defensemen, all 12 forwards. It's not individual players [or] personnel. It's about the team. I think that's what we've been stressing, trying to get back to the team strength … even more so when you lose one of your top players. You have to rely on the balance, not just one player to replace Patrick."